Christmas has arrived early in Konami land, with the Japanese publisher releasing a flurry of new content for footy favourite PES 2017 earlier today. Data Pack 2 is available as a free download now, and delivers three new stadiums: Signal Iduna Park (Borussia Dortmund), Allianz Parque (Palmeiras), and Anfield (Liverpool). The latter inclusion is part of a tie-in with the 18-time English champions, which also sees their victorious Champions League strip from 2004-05 added – one of 16 fresh kits included in the new pack. If player likenesses are your jam, there are over 100 updated faces to get excited about. Adrian Ramos and Marco Reus (both Dortmund), Neymar and Lionel Messi (both Barcelona), and Sadio Mane (Liverpool, again) are among those given a spot of cosmetic surgery. And new footwear is a thing too, with 11 fresh boot styles available for assignment within edit mode. The data pack is just one element of a significant day on Konami's virtual turf. It's also announced a downloadable, free 'trial edition' of PES 2017, with nine teams and access to an upcoming, eSports-focussed 'PES League' mode. 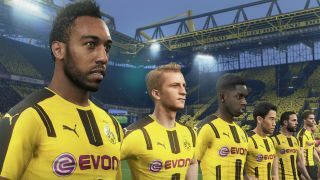 Related to that, it's named Dortmund forward Pierre-Emerick Aubameyang the official ambassador to PES League, which will launch in December. You can sign up in advance at pesleague.com. All matches played within the mode count towards the PES World Finals, which will take place in June 2017. PES 2017 is out now on PS4, PS3, Xbox One, Xbox 360, and PC.